Somebody has to do the dirty work. And those who do it will want the inherent barrier protection that DuPont™ Tyvek® protective apparel offers. Tyvek® protective apparel helps protect your workers against small size hazardous particles. That includes particles such as lead, sbestos, and mold. Protection is built into the fabric itself; there are no films or laminates to abrade or wear away. And for a better fit, Tyvek® garments with comfort fit design have been engineered for enhanced worker range of motion and durability in use. So whether performing asbestos abatement or installing insulation, we want to help you protect your workers. 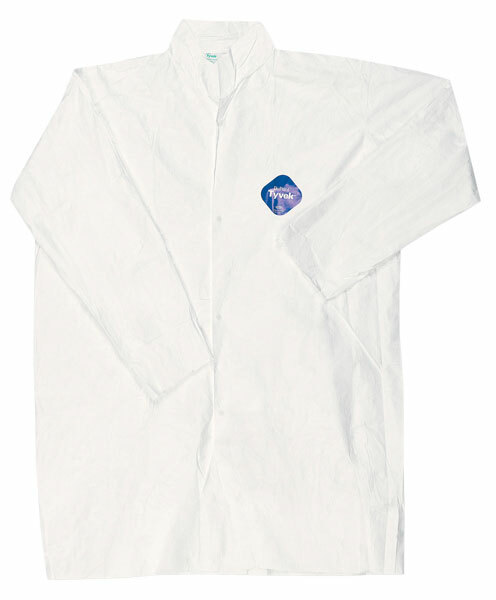 The TY210S is a Lab Coat with collar, front snap closure, and open sleeves.